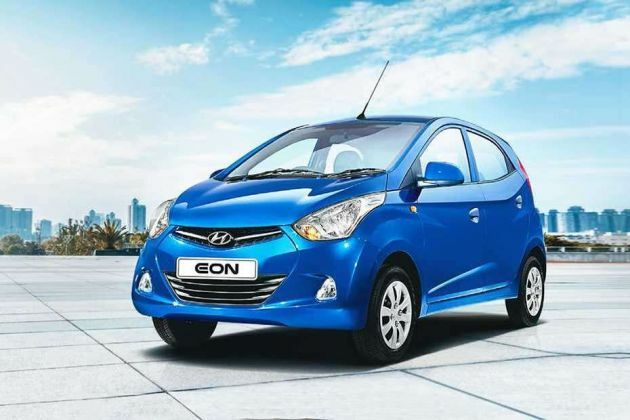 Hyundai EON Sportz is a petrol variant that is offered with a plenty of features. This hatch comes with a reinforced body structure that has many styling elements. It has clear headlamps and a chrome tip radiator grille at front. The sides have full wheel covers and outside rear view mirrors. And in the rear, it has an integrated spoiler, which gives it a sporty look. Inside the cabin, there are a few storage spaces as well as utility based aspects. The company has offered a foldable rear seat, electric power steering column, 2-DIN audio unit, digital clock, air conditioning unit and many other such interesting attributes that increases the comfort levels. It is incorporated with a sophisticated suspension system that thoroughly amplifies the overall ride and handling quality. Apart from these, it comes loaded with some security attributes like seat belts, central locking system and a high mount stop lamp to name a few. Its exteriors look just great with the styling attributes all over. At front, there is a clear headlight cluster equipped with turn indicators. This surrounds the bold radiator grille, which gets a neat chrome finish. The windshield is pretty large and integrated with a couple of wipers. It is fitted with a bumper that houses an airdam as well as bright fog lamps. Moving to its sides, there are body colored door handles, outside rear view mirrors and B-pillars. The neatly carved wheel arches are equipped with a set of 13 inch steel wheels. These have full wheel covers and tubeless tyres of size 155/70 R13. Meanwhile, it has an eye catching rear profile that includes an integrated spoiler and windscreen with a high mount stop lamp. Also, there is a stylish boot lid surrounded by clear tail lamps and a well sculpted bumper that is painted in body color. This trim has elegantly designed interiors that have a two tone beige and brown color scheme. To describe its cockpit, it looks modernistic with equipments like a three spoke steering wheel, instrument cluster and a center console with silver finish. It has molded door trims, while the plastic used inside are of high quality. There is a bench folding seat in the rear and at front, it has bucket type seats. Also available is an exclusive dashboard storage compartment and pedestal space. The metallic finish on door handles and steering wheel further makes it look appealing. Besides these, the cabin also has floor console storage, cup holder, three assist grips, rear parcel tray and front door map pocket with bottle holder. Under the bonnet, it has a 0.8 litre petrol engine whose total displacement capacity is 814cc. It carries three cylinders, 9-valves and is based on a single overhead camshaft valve configuration. It is integrated with a multi point fuel injection system. This can churn out a peak power of 55.2bhp at 5500rpm and at the same time, delivers torque output of 74.5Nm at 4000rpm. A five speed manual gearbox is coupled with this motor that distributes power to its front wheels. When accelerated, this trim goes from 0 to 100 Kmph in about 21.1 seconds and attains a top speed of 130 Kmph approximately. On the city roads, its fuel economy comes to nearly 17kmpl, while this figure goes up to 21kmpl on the highways. It is offered with a sophisticated suspension system that makes the drive smooth irrespective of road conditions. The front axle has a McPherson strut, while the rear one gets a torsion beam axle. The manufacturer has bestowed it with a motor driven electric power steering column that has tilt adjustment function. It has a reliable braking system wherein, the front wheels have disc brakes, and the rear ones get drum brakes. This five seater is equipped with many impressive features, which make it a perfect choice for small families. The instrument panel includes a dual tripmeter, gear shift indicator, fuel gauge and a low fuel warning lamp. It has front power windows, while the outside mirrors are internally adjustable. There is a full size armrest on the front door, while a power outlet is also available. For entertainment, it is bestowed with a 2-DIN audio system featuring a radio tuner and MP3 player. This supports USB port, auxiliary input option and has two speakers as well. In addition to all these, it comes with a tilt steering wheel, air vents, remote tail gate release as well as fuel lid opener. When it comes to safety, this lineup has a reinforced body structure side impact beams and radiator support panels. There is an airbag available for driver, while seat belts are offered for all occupants. Besides these, the list also includes engine immobilizer, central locking, child safety rear door locks, and keyless entry that adds to the security quotient. 1. Impressive interiors with sophisticated attributes. 2. Available at an affordable price tag. 1. It has a low ground clearance. 2. More interesting aspects could have been added.